Tennessee’s men’s basketball program hasn’t had the greatest luck in the NCAA Tournament. But Grant Williams understands that the Big Dance will define him and his team this year. The Vols just got beat soundly by Auburn in the SEC Tournament Finals, but before that they had a strong comeback victory over Kentucky in the semifinals of the tournament. Because of that performance and Tennessee’s overall body of work in the regular season, Tennessee earned the third No. 2 seed in the NCAA Tournament in school history. The Vols will face-off with 15-seed Colgate in the first round, and they could potentially face seven-seed Cincinnati in Columbus, Ohio in the second round. Tennessee’s draw isn’t exactly easy, but they do get to play somewhat close to home on Columbus, and if they make it to the Sweet Sixteen and Elite Eight, they’ll be playing in Louisville, Kentucky. 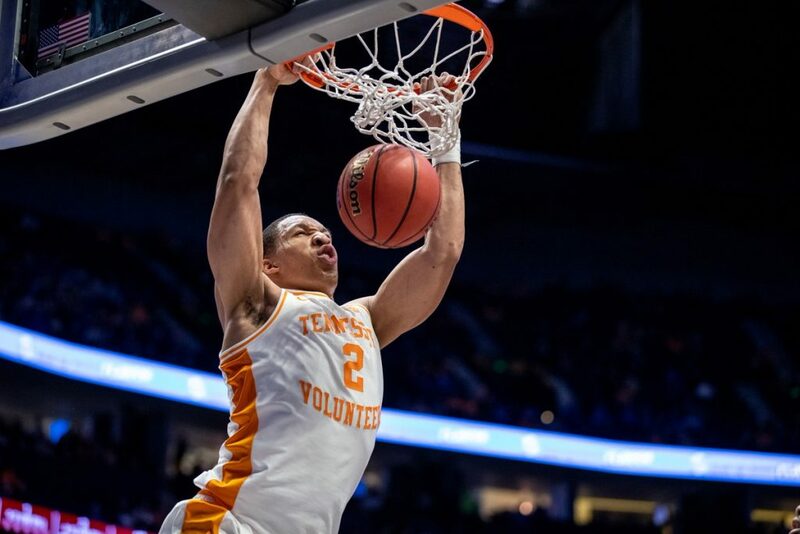 Two-time SEC Player of the Year Grant Williams and the rest of his teammates are still fueled from the Vols’ second round exit in last year’s NCAA Tournament. Tennessee was a No. 3 seed last year, but they got bounced in their second game of the tournament by Loyola-Chicago. The Ramblers went on to make it to the Final Four, but that didn’t ease the sting for Vol fans or UT’s team. This year, Tennessee’s players are happy to make it back to the NCAA Tournament, but they understand better now just how “do or die” the tournament is. “It can all be over so soon,” Williams said during a video interview shortly after the Vols found out their seeding in the tournament. “That’s that threat that’s always in the back of your mind, but you also have to have the mentality of, hey, keep winning and keep having fun and you get more time to spend with your brothers every single day. Since the NCAA Tournament expanded to 64 teams in 1985, the Vols have only made it as far as the Sweet Sixteen five times, and all five of those instances have come since 2000. Tennessee reached the Sweet Sixteen in 2000, 2007, 2008, and 2014, and they reached the school’s only Elite Eight in 2010. Other than those runs, the Vols have struggled to make it past the opening weekend. The Vols have only made the NCAA Tournament 14 times since 1985 (counting this season), and they’ve failed to make it past the second round in eight of those instances. In fact, Tennessee has gone one-and-done in the tournament in five of those appearances, and they’ve only won one game three other times. Tennessee has failed to win a game in the NCAA Tournament just as many times (5) as they’ve made it to at least the Sweet Sixteen (5) since 1985. Last year, the Vols surprised the basketball world by winning a share of the SEC regular season title, making it to the SEC Tournament Finals, and getting a No. 3 seed in the NCAA Tournament. But the season ended on a sour note because of an early exit in the Big Dance. This year’s team wasn’t the surprise last year’s squad was, but their success this season makes a deep NCAA Tournament run even more of a priority. Tennessee ascended to No. 1 in the AP Poll for only the second time in school history, and they won a program record 19-straight games during the regular season. Despite all that, this year’s Vol squad doesn’t have any SEC titles to show for their efforts. They finished a game short of both a regular season title and a tournament championship. Getting to only the second Elite Eight in school history or the first Final Four in program history would alleviate the pain of coming up short in the SEC, and it would give this year’s team the ending many Vol fans think this particular collection of players deserve. Grant Williams knows his team will be defined by what they do in the NCAA Tournament. Vol fans are hoping he and his teammates can make some more history by the time April rolls around.